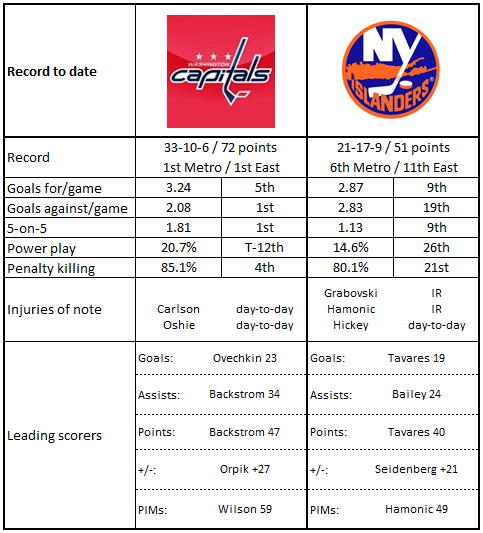 With the NHL All-Star Game in their rear-view mirror, the Washington Capitals begin the “second half” of the NHL regular season on Tuesday night when they head to Brooklyn to take on the New York Islanders in the last of a six-game home stand for the New Yorkers. The Caps will be looking to resume their blistering run that carried them to a 20-3-3 record over their last 26 games going into the break. Meanwhile, the new-look Islanders and their new interim coach, Doug Weight, will bring a 5-0-1 record in their last six games into this contest. Weight took over the bench duties when Jack Capuano was relieved of his head coaching responsibilities following the Islanders’ 4-0 win over the Boston Bruins on January 16th. Capuano spent seven seasons behind the Islander bench, compiling a record of 227-192-64 (the win total second only to Al Arbour in club history) and taking the Islanders to the post season three times. Twice he led the team to 100-point seasons. Weight was named to an assistant coach position by the club in 2011-2012 after a 19-year NHL career with six clubs in which he played more than 1,200 games and recorded 1,033 points, winning the Stanley Cup with the Carolina Hurricanes in 2006. In the five-game Weight Era to date, the Islanders are 4-0-1, outscored their opponents by a 16-8 margin, converted four of 19 power play chances (21.1 percent), and killed off nine of 11 shorthanded situations (81.8 percent). John Tavares has been on a very productive run of late, straddling the change in coaches. Since December 23rd, he is 10-7-17, plus-6, in 15 games. He is their leading goal scorer and point getter under Weight so far (3-5-8 in five games). It is something of a turnaround that had him with a rather sluggish (for him) 9-14-23, minus-1, in his first 32 games. His next goal will be his 20th of the season, giving him eight in his first eight-NHL seasons. It would also break a tie with Bob Nystrom for the sixth-most 20-goal seasons in Islander history and lift him into a tie for fifth place with Clark Gillies. Bryan Trottier has the most 20-goal seasons in club history (13). Tavares is 12-13-25, plus-5, in 29 career games against the Capitals. Nick Leddy brings a four-game points streak into this contest (1-5-6, plus-3) and leads the Islander defensemen in goals (8), assists (19), and points (27) this season. He is also the leader in ice time per game among defensemen (23:00), as well as power play goals (2) and points (10). Leddy has been something of a bellwether for the club, and not in a good way. He has goals in eight games this season, and in those games the Isles have a record of 1-4-3. Leddy is 1-5-6, even, in 16 career games against the Caps. That goal came in his first game against Washington, in 2011 when playing with the Chicago Blackhawks. The Hawks lost in overtime. Ex-Capital Jason Chimera might not have been the happiest Islander to see the All-Star break come. In eight games leading up to the break, Chimera scored five goals, four of them in Islander wins. The outburst doubled Chimera’s goal total for the season to ten and might have been an indicator that the odd sawtooth year-to-year progress in goal scoring (up on year, down the next, up the next, and so on) over the last seven seasons is going to be interrupted after he recorded 20 goals for the Caps last season. The odd part of his recent production is that he is doing it without getting a lot in the way of ice time. Chimera averaged just 11:39 in ice time over his last nine games and was under ten minutes twice. He is 2-2-4, plus-4, in nine career games against the Caps. 1. No team in the Eastern Conference has played in more home games to date than the Islanders (28). Only Chicago has had more games on home ice so far (29). 2. The Islanders are the second-worst team in the league at home on the power play, converting just 12.7 percent of their opportunities. Add to that the fact that the Isles are 24th in the league in penalty killing at home (78.5 percent), and that home special teams index of 91.2 percent looks rather weak. And how bad is the power play overall? The Isles have more 5-on-3 power play time than any team in the league (10:37), and they have just one goal to show for it. 3. New York is the worst team in the league in one-goal games, carrying a winning percentage of just .286 into this contest (6-6-9). One of those six one-goal wins is against the Caps (4-3 on December 27th). 4. No team in the East has allowed more third period goals than the Islanders (55, tied with Philadelphia). Only Dallas and Vancouver have allowed more (57). 5. As if to complete the misery, the Islanders rank 29th in the league in Corsi-for at 5-on-5 (46.61 percent). Their CF% is only slightly better adjusted for score, zone, and venue (47.16 percent, ranked 27th; numbers from Corsica.hockey). 1. With three winning streaks of five or more games this season (five, six, and nine), the Caps are a good portion of the way to matching last season, when they had five such streaks (five, six, ten, five, and five). In their other Presidents Trophy-winning season (2009-2010), they had four such streaks (six, six, 14, and five). 2. Only Minnesota – yes, Minnesota – has more ten-goal scorers (8) than the Caps (7, tied with several teams). 3. Only two teams in the league have spent more time killing penalties than the Caps (299:52), Calgary (330:15) and Anaheim (308:18). No team has a larger time deficit on special teams (power play time less penalty killing time) than the Caps (minus-54:55). 4. No team has more wins this season by three or more games than the Caps (15, tied with Montreal). 5. The Caps have the second-worst penalty differential in the league in road games. Their minus-20 differential is only better than the Boston Bruins (minus-25). It has taken a while, but Thomas Greiss would appear to finally be a number one goalie in the NHL. Until this season, Greiss had never appeared in more than half of his team’s games, and he accomplished that feat just once in seven seasons, that being last year in his first year with the Islanders (23-11-4 in 41 games). With Jaroslav Halak in Bridgeport in the AHL, and the club taking a slow approach in the development of Jean-Francois Berube, Greiss is the man of the moment, having appeared in 11 of the Islanders last 12 games, over which he has a record of 6-2-3, 1.99, .936, with two shutouts. He is 1-1-1, 2.65, .924 in three career appearances against Washington. Quick…how many games this season have the Caps lost in regulation time this season with Taylor Chorney in the lineup? The answer is “one.” The Caps are 11-1-2 in the 14 games in which Chorney dressed this season, the regulation loss coming to Ottawa last Tuesday. Over two seasons, the Caps are 51-11-7 in games in which Chorney appeared. This might be the poster child of “correlation is not causation” as it applies to hockey, but Chorney is not, at least on a performance basis, the liability his personal stats would indicate on a production basis. For example, among Capitals defensive pairs with at least 50 minutes of 5-on-5 ice time, the two pairing including Chorney (with Brooks Orpik and with Nate Schmidt) are the worst on the team (numbers from Corsica.hockey). Only 18 of 231 defensemen appearing in ten or more games have fewer than the three points Chorney has. But hey…winning. In four career games against the Islanders, he is 0-0-0, minus-2. If you are thinking that the Caps are especially susceptible to an All-Star break induced let down, then you really are a Caps fan. Here’s a tip from your Uncle Peerless…30 teams are coming out of the All-Star break, and there is little to hint that any team more or less than any other will behave differently than they did going into the break. The thing here is, both teams were doing well going into the All-Star Game break, but the Caps haven’t lost in regulation to an NHL team in an American city in their last 16 games, their only regulation loss in that 13-1-2 stretch coming against the Ottawa Senators. Then again, the last team in an American city they did lose to was the Islanders in Brooklyn on December 27th. Guess it’s time to address that matter.